Energy Thoughts and Surprises: What is your recycled waste worth? What is your recycled waste worth? Some of the stuff in our bin is worth something. For most wastes the council has to pay someone to dispose of it safely but it is now the case that recycling facilities are actually paying for some of the stuff in our rubbish, which is good news for our council tax . Sometimes recycling saves us money as well as protecting the environment. The 22 million households in England produced 25.6 million tonnes of rubbish in 2011/2012 of which 9.6 million tonnes (37%) went to landfill . That's an awful lot of landfill but it used to be even more: ten years ago 22.4 million tonnes went to landfill (79% - we have slightly reduced the total amount of rubbish we generate). The main reasons for moving away from landfill are firstly running out of suitable landfill sites and secondly the environmental impacts of landfill, including carbon emissions. Food and other organic waste rots down over time. Underground, where oxygen is in short supply, this generates methane and methane is a very powerful green house gas. 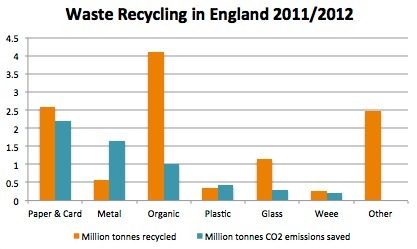 In 2010, waste handling was responsible for 3% of UK carbon emissions . The chart below shows how much recycling reduced our carbon emissions in 2011/2012. The largest part in terms of waste generated is organic stuff: food and garden waste. However, in terms of carbon emissions saved paper is the big hitter, and metals, despite the relatively low weight, are also important. This is because it takes less energy to make paper from used pulp rather than from virgin trees, and similarly with metals. This is also true for glass but in practice most of our coloured glass is used to make roads and other construction projects rather than being recycled as glass. This is because of the difficulty in making new glass with a precise colour from a mix of old glass. The table below shows the values as waste materials of some of these items . Paper, metals and some plastics are worth so much now that materials recycling facilities (MRF) plants are prepared to pay councils for those parts of our rubbish. However, quality is key and so we see that clear glass is much more valuable than mixed, and sorted paper waste is worth more than mixed. The reason that councils are moving over to mixed recycling collections is mainly to do with increasing recycling rates: it seems we don't mind sorting stuff into a few categories but keeping everything separate takes too much space and effort. Paper and plastics also have high calorific value and can be burnt to generate energy. This may be the best way to handle plastics, but when it comes to paper there is no reason not to recycle it a few times first. There is a limit to this because each time you recycle the fibres get shorter which weakens the paper. You can recycle it 5 times or so . The trouble with organic waste handling is that you will get some emissions no matter what you do with it and also it is often wet which means transport costs are high. If you compost it at home, you save on transport but it is very important that you manage your compost heap to reduce emissions. Don't let it get wet and smelly, as it will be generating methane. Also, if you have too much high nitrogen stuff in it you may get nitrous oxide released which is even worse than methane so if you have a lot of food waste you should bulk it up with a bit of shredded paper. I know that our council sends the organic waste to an in-vessel composting plant. This has lower emissions than open windrows - those long piles in the open air that get turned by tractors  - though it is a bit more expensive. We can use the compost generated in our gardens but it is also good for farmers to improve their soil. Another way to dispose of organics is to use anaerobic digestion (AD). This modifies the composting process to generate as much methane as possible which can be used for energy; the stuff left over ('digestate') is an excellent fertiliser . The AD process can handle pretty much any sort of organic waste, from vegetable peelings, to cow dung or beer brewing waste, as long as it is consistent. However, you do need a lot of it. Greater Manchester now has an AD plant for handling waste from the Greater Manchester area. This takes 100,000 tonnes per year and it generates 2 MW electricity, enough for around 5000 households . However, Manchester still composts most of its food waste; it only uses the AD plant for residual waste that wasn't separated out for recycling . Sadly the costs of building and running AD plant are so high that even with feed in tariffs AD companies still need a gate fee to make an overall profit. Perhaps this will improve over time. Hi Nicola. My name is Priyanka Jain. Incidentally, I also studied in Cambridge, UK and graduated from there just last year. Greentales is a collection of all ideas for a sustainable home. I really like your blog, and wanted to ask you if you would like to share your ideas on greentales. We are going to move to a much better looking website slowly. We are also building our facebook, pinterest and twitter community. My job is to get you as much readership as possible and spread the great ideas you have. Please let me know if you are interested. All you have to do is post all the actionable ideas that you have on greentales. I have bookmarked your blog site since it talks more on dealing dirt exchange in http://www.dirtexchange.net/. If possible, as you gain information, please add to this blog with new information. I have found it extremely useful.